Strikeforce Lightweight Champion Gilbert “El Niño” Melendez has suffered a shoulder injury and has withdrawn from his bout with Pat “Bam Bam” Healy this Saturday in Sacramento, California. Strikeforce officials announced late Sunday night that the entire event has been cancelled as a result. 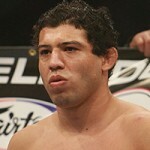 Melendez was set to defend his title against Healy in the Strikeforce main event, but the promotion’s television partner, Showtime, was unwilling to air the event once Melendez was removed from the card. Strikeforce has not yet announced whether the remaining nine bouts will be rescheduled. Melendez (21-2-0) is widely regarded as one of the premier lightweights in MMA today and he has held the Strikeforce title since reclaiming the belt from rival Josh Thomson in a December 2009 rematch. Melendez is currently riding a seven-fight winning streak and most recently retained his title with a hard-fought decision victory over Thomson in the pair’s rubber match in May. Healy (28-16-0) has won eight of his past nine fights and is currently in the midst of a career resurgence since making the move down to 155 pounds. He earned his shot at the Strikeforce championship with a victory over Japanese standout Mizuto Hirota in July. Healy will likely remain the number one contender to Melendez’s title, but it is currently unclear as to when the fight may take place. Melendez is expected to be sidelined for one month. Among the other bouts scrapped from Saturday’s card is a planned bantamweight matchup between Strikeforce newcomer Cat “Alpha” Zingano (6-0-0) and Amanda “Lioness of the Ring” Nunes (7-2-0), who was returning to Strikeforce after picking up a quick victory at Invicta FC 2. Zingano was looking to make her long-awaited return to the cage after injuries kept her on the sidelines earlier this year, but her Strikeforce debut will have to wait. The next Strikeforce card is currently scheduled for November 3rd in Oklahoma City, Oklahoma. That card is without a main event due to an injury sustained by former UFC Heavyweight Champion Frank Mir. Undefeated Olympic silver medallist Sara McMann (6-0-0) makes her Strikeforce debut against former title challenger Liz “Girl-Rilla” Carmouche (8-2-0).